Chamilia presents this beautiful Diva stacking ring! 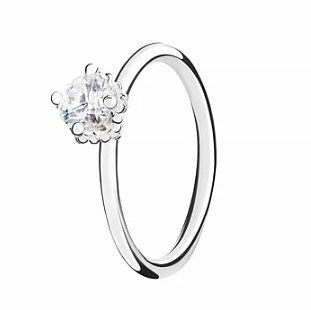 Crafted from polished sterling silver, this solitaire style ring is set with a single shimmering White Swarovski Zirconiafor stunning sparkle. Wear alone or stack them high, create a style that's totally unique and be inspired with Chamilia stacking rings. Size extra Large. Chamilia Swarovski ZirconiaDiva Stacking Ring XL is rated 5.0 out of 5 by 2. Rated 5 out of 5 by Anonymous from I’m so in love with this ring! So sparkly and made in really good condition So in love with this ring one of the best things I’ve purchased from a jewlrey shop! Would definitely recommend!